People tend to make plans. That is just what people do. Some of the plans seem really good when they are being made, and many of those plans actually work out pretty well; some of the plans that seem good at one point actually turn out terribly. It is often hard to know how things will work out in the end. Nobody can accurately predict the future. All we can really do is hope for the best. Plans that go horribly are often as amusing as plans that go really great. 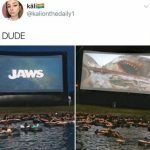 Here are fifteen rather interesting examples of plans that went really well or really terribly. I am guessing that the photographers wanted the child in this picture to appear happy. Ordinarily, children in costumes at least have a smile on their face. However, in this case, the child looks kind of bored and depressed. If I had to guess, he is depressed because his costume is kind of crappy. 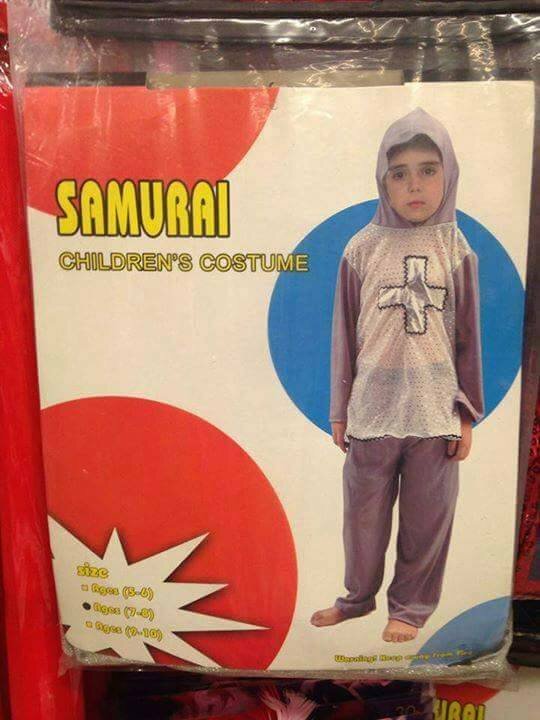 The poor kid doesn’t even have a fake sword! That is a terrible Halloween costume. The kid is probably thinking that his parents do not love him very much. The plan for this particular photoshoot did not work out so very well. Things went terribly. I am not sure what Hana was thinking with this profile picture. 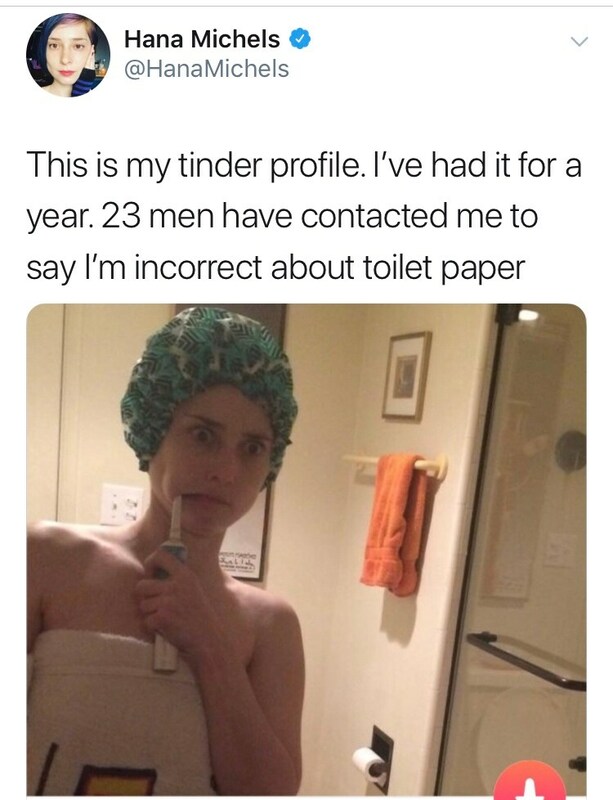 It is kind of funny that men are contacting her about her toilet paper situation, though; it seems like something people who use Tinder would do. Even if the toilet paper wasn’t an issue, which it apparently is, there is a lot wrong with this profile picture. Last time I checked, you are supposed to look your best when using dating apps. Hana is not looking her best. Granted, she is showing off a bit of skin, but everything else is sort of a mess. The look on her face is sort of scary, and shower caps are not a great look on anyone. In case you are wondering, the jury is still sort of out when it comes to toilet paper orientation. However, it seems as if most people prefer it when the toilet paper hangs over the roll, not under (or behind) it. For reasons that I will never understand, a lot of people have pretty strong opinions on the matter. I honestly had no idea people still played the card game “Uno” anymore. Of course, I’m still surprised when I hear of people getting together for “board game night”. Honestly, I thought all card games these days were played online. I guess I was wrong. Uno is actually a pretty great game, which is probably the reason people have been playing it since 1971. It has been a brand of the company Mattel since 1992. Actually, there are Uno video games. 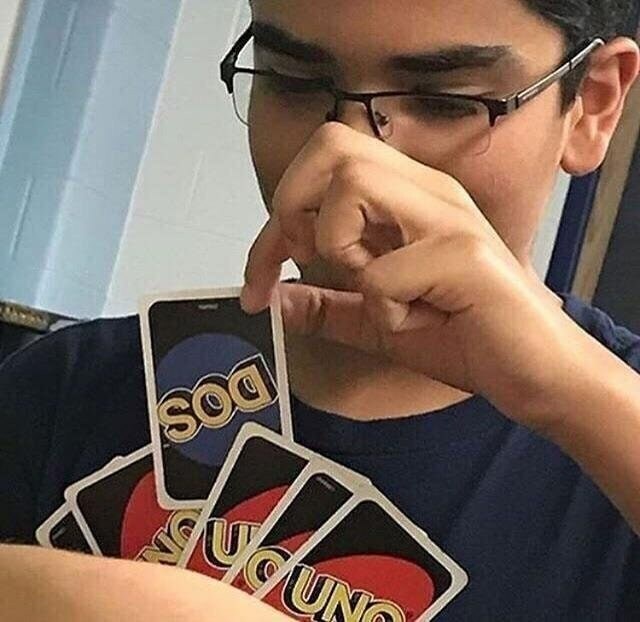 That’s how popular Uno is. I did not see this episode of the popular children’s program, as I haven’t actually watched the show in decades, but Big Bird allegedly ate an American flag. I’m really not sure what transpired. The whole thing might have been a joke. We are talking about a satire site, after all; therefore, it was almost definitely a joke. However, in the image, it does appear as if Big Bird is eating an American flag, and people were upset. 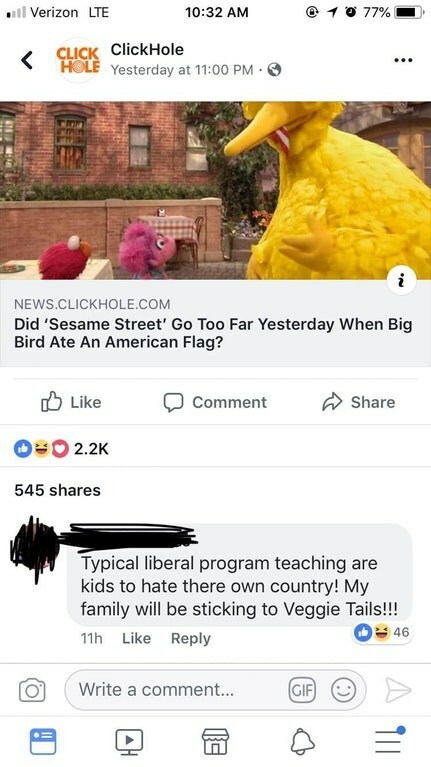 One person described “Sesame Street” as a “typical liberal program” that is teaching kids to hate their country. Therefore, that person will be sticking to “Veggie Tails”. That person, I assume, meant “VeggieTales”, which is about anthropomorphic vegetables and fruits. The show’s talking produce teaches moral lessons based on Christian culture. It is surprisingly popular. There were movies, and there have even been VeggieTales video games for the PC, Playstation 2, Gameboy Advance, and mobile phones. Thanks to social media, average folk have the opportunity to clumsily hit on celebrities we would never be able to engage with otherwise; most celebrities probably wouldn’t give us the time of day if we met them in real life, but hope springs eternal in some people. 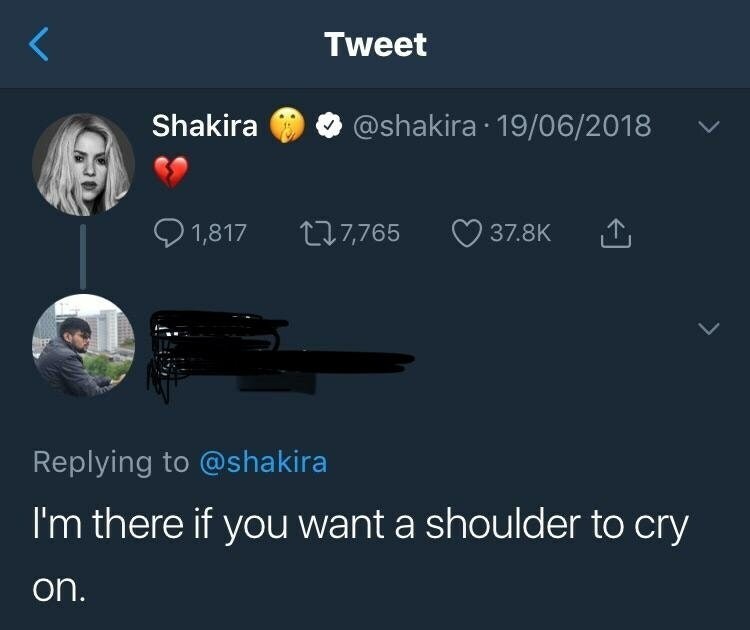 This guy tried to hit on Shakira, offering her a shoulder to cry on. That was a bold move. It was kind of a dumb plan, honestly, as there was no way it was going to work and now he is being teased on the internet, but it was definitely a bold move. 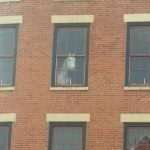 You have to give him credit for having courage. Shakira, of course, is a well-known singer and dancer. The 41-year-old performer has received several awards, including Grammy Awards and MTV Music Video Awards. For years, she was considered one of the most powerful women in the world by Forbes Magazine. She is also one of the best-selling artists of all time. Stealing other people’s intellectual property is wrong, of course. You should not do that. However, if you are going to steal, don’t be weird about it. What is up with the titles of these games? “Who am I?” Who wants to play a game named that? That doesn’t sound like a game. That’s sounds like the title of a really angst-ridden blog post. “Don’t Torment Me” is even worse. That sounds like a “game” designed for victims of bullying. What parent would buy either one of those games for their children? 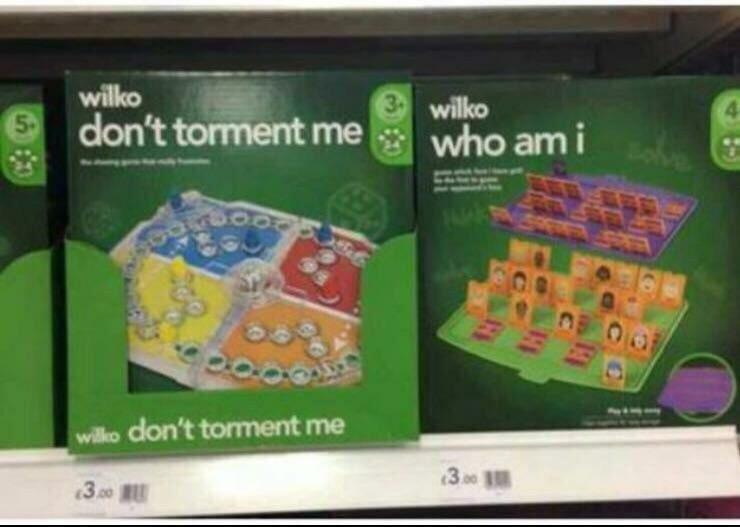 It appears these games are produced by Wilko, which is a relatively reputable company in the United Kingdom, which makes the names even more baffling. 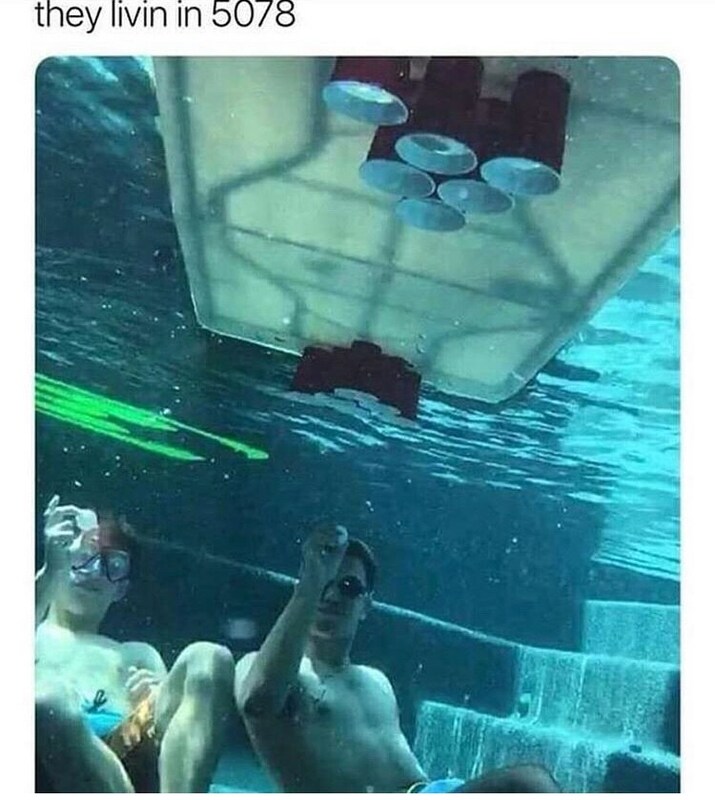 This appears to be some sort of underwater variation on the popular drinking game beer pong, except I am guessing there is no actual beer involved, which sort of defeats the point of the game. It also seems like this game would take quite a while to set up, so I’m not sure why these guys bothered. Maybe they just wanted to take a really cool picture. It is a cool picture, and the guys do look like they are having fun, so everybody wins. Beer pong is also called Beirut or six-cup. It is believed that the game originated in either the 1950s or 1960s at Dartmouth College. The game is, perhaps unsurprisingly, very popular. There is even a beer pong tournament called “The World Series of Beer Pong”. There are also several leagues that operate on local and regional levels. Naturally, beer pong is sort of controversial because it seems to promote binge drinking. Many in the news media believe it to be a factor in the alcohol-related deaths of college students. The model’s plan was a bad one for a couple of reasons. First of all, if you are going to blackmail someone, you should blackmail them for an enormous amount of money. Two thousand dollars is sort of a paltry sum. Also, I’m not sure what Jaromír Jágr was supposed to be embarrassed about. 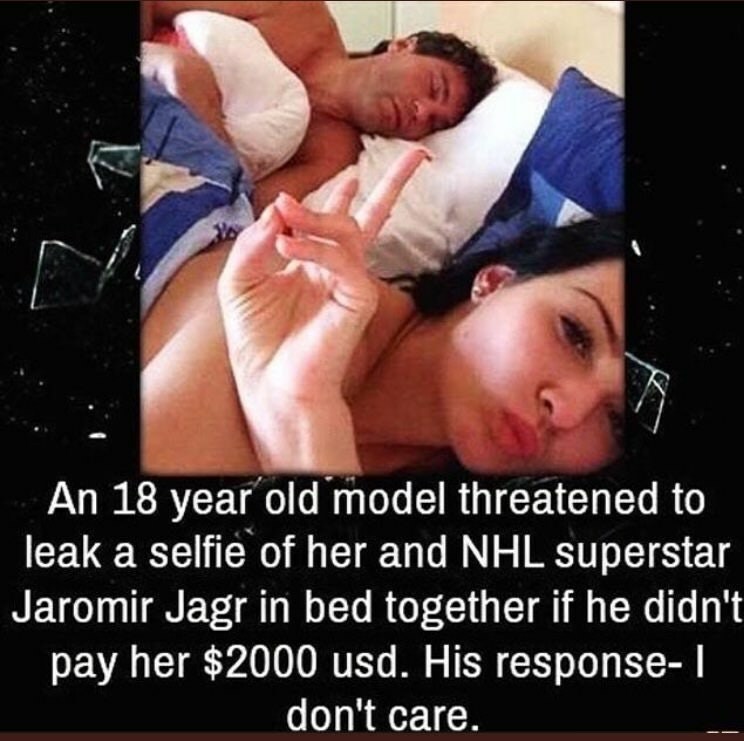 Is he supposed to be ashamed of the fact he went to bed with a young, attractive model? There is a good reason he simply told her “I don’t care”. Why would anyone care? His response makes perfect sense, really, when you think about it. She really did not think her plan through. If you are not familiar with the man, Jaromír Jágr is considered one of the greatest hockey players of all time. He has played in the NHL for several teams, including the Philadelphia Flyers, the New York Rangers, the New Jersey Devils, and the Dallas Stars. He has set several NHL records and won several NHL awards, including the Art Ross Trophy. For reasons unclear, the illegal dumping of boats was—or maybe still is—a problem in the city of Detroit. Illegally dumping your boat seems like a bad idea. For one thing, it is probably pretty easy for law enforcement to trace your boat back to you. As pointed out in the image, boats do have ID numbers. You generally have to register your boat, at least in the United States. It is pretty funny that the newscaster “returns” the boats to their owners. 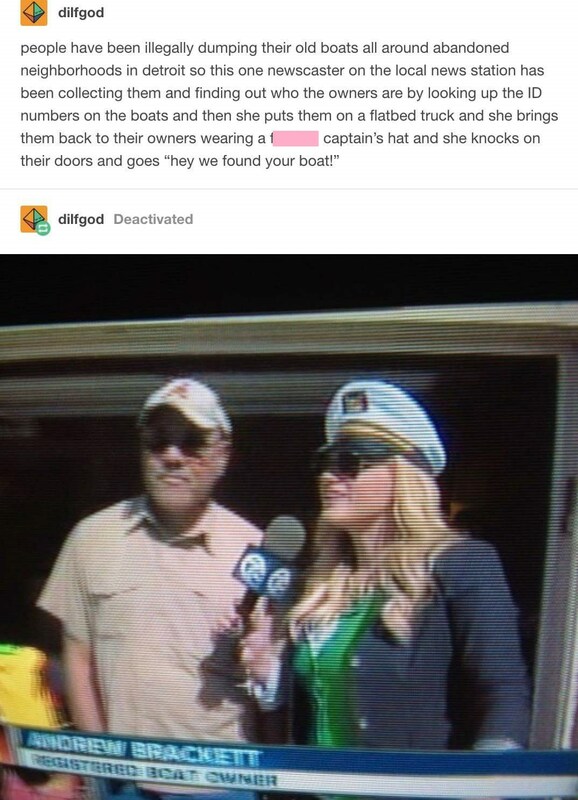 It is even funnier that she wears a captain’s hat when she does so. I can’t imagine why anyone would just abandon their boat. Last time I checked, boats are not cheap. Even if the boat has mechanical issues, they can be repaired. I understand that boats cost a lot to maintain, of course, but why wouldn’t you just sell your boat if you couldn’t afford to maintain it? Doesn’t that make a lot more sense? If you are having money problems, shouldn’t you try to get at least some of your boat money back? You really have to wonder what the streets of Detroit look like with all of those abandoned boats sitting around. This is both a brilliant plan and a terrible one. It really depends on how you look at it. One the one hand, is there a person out there who earnestly believes anyone will pay five dollars for sprinkles on top of a piece of bread? On the other hand, maybe there is an untapped market out there. Maybe there are people out there who really love sprinkles on bread and don’t feel like sprinkling the sprinkles themselves. If that’s the case, and you can make five dollars a pop off of those people, this is actually a brilliant product. 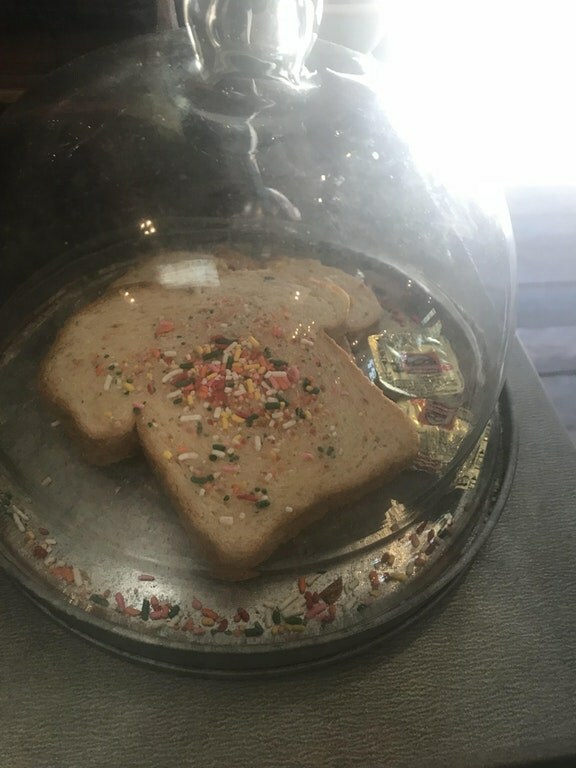 It might just be the photography or the presentation of the sprinkle bread, but it actually looks like a pretty delicious snack. It looks like it comes with butter, too, which is always a plus. Apparently square watermelons are a thing. They are apparently very difficult to grow and are not even edible. They also cost a small fortune. Why would you pay a lot of money for a food product that you can’t eat? That is kind of insane. People buy wax fruit, though, so I guess the whole thing is not that strange. 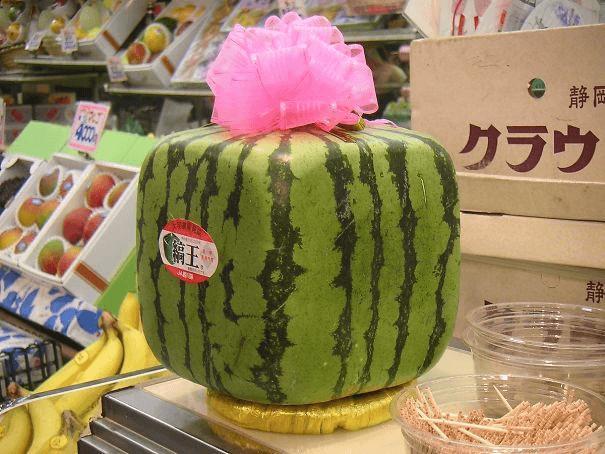 Admittedly, the square watermelon looks pretty cool, but it is also a sort of weird status symbol. If it only cost a few bucks, I could understand buying it. 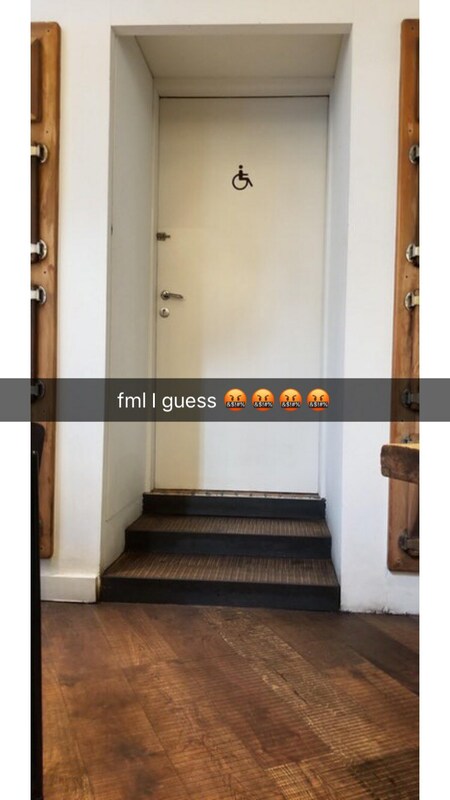 Spending hundreds of dollars on it, though? That’s just bizarre. 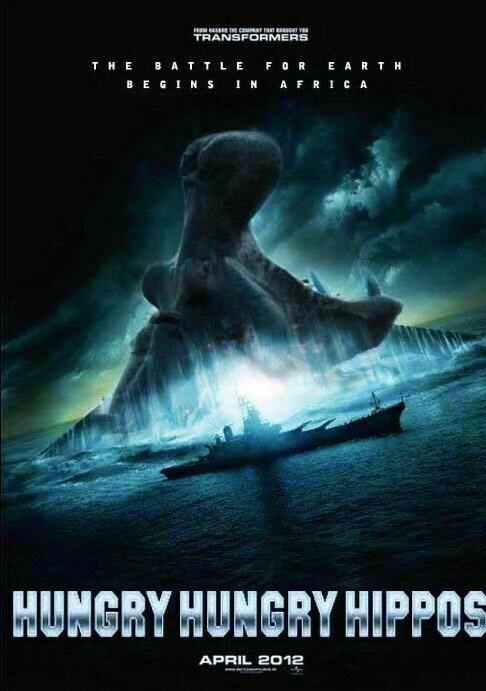 A movie about the game Hungry Hungry Hippos seems like a bad idea; however, the “Sharknado” movies were immensely popular, so I’m guessing a movie about evil hippos would also do pretty well. I could see many successful—or at least somewhat successful—Hollywood actors signing up for that project. Hungry Hungry Hippos, of course, is a very popular tabletop game that was first released in the late 1970s. The game is published by Milton Bradley. If you are not familiar with the “Sharknado” series, the first film came out in 2013. It starred Ian Ziering and Tara Reid. Four sequels have been released, and a sixth film is currently being produced. It is expected to be the final film in the series. Acronyms are great. They help you remember things. “KISS” means “Keep It Simple Stupid”. Everyone can remember that. Unfortunately, not all acronyms are created equal. What appears in this image isn’t even really an acronym. 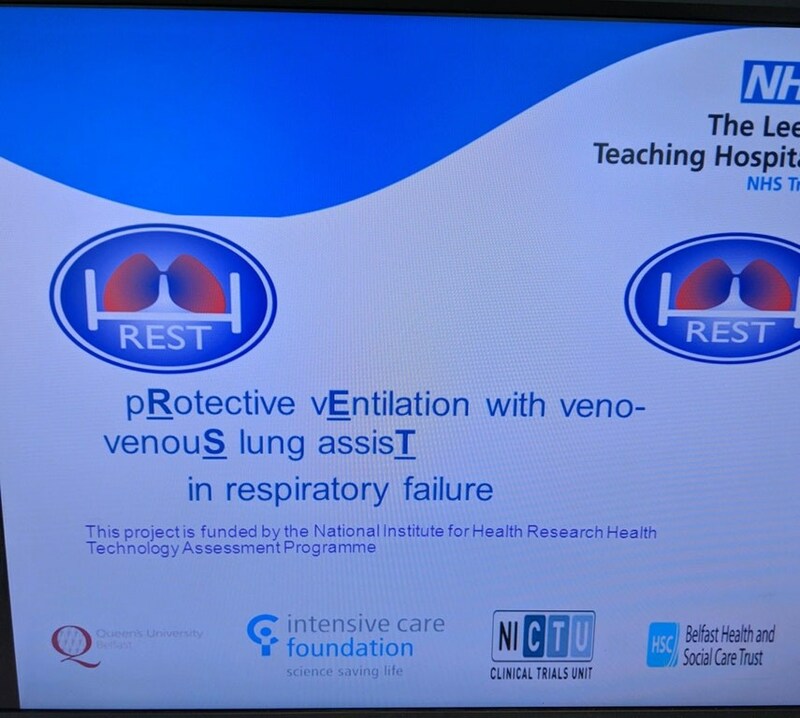 I don’t see how remembering the word “REST” will help with anything involving respiratory failure. The National Institute for Health definitely failed on this one. It is like they weren’t even trying. Is it illegal to use a bathroom marked with the handicapped symbol if you are not handicapped? 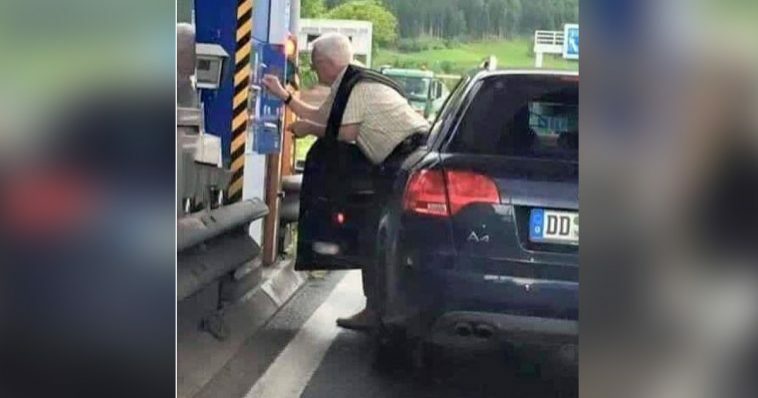 Honestly, I am not sure. I imagine the laws vary from place to place. I know that, in the United States, you can get fined a lot of money if you park in a handicapped spot and you are not technically handicapped, but I have no idea how the bathroom situation works.